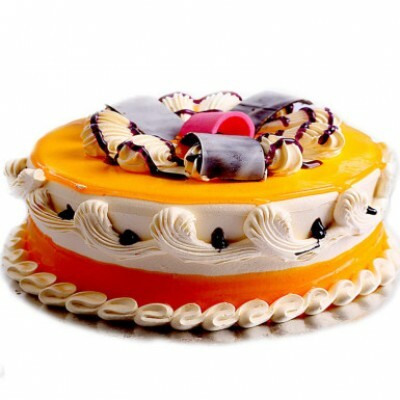 This cake is adorned with the whipped cream swirls and iced with the mango flavored cream. The top of the cake is adorned with chocolate chips and juicy cherry. The basic ingredients of this mouthwatering mango treat are flour, sugar, butter, vanilla cream, mango flavored cream, chocolate flakes and cherry for decoration. All the layers of the cake are heavily layered with the vanilla cream and mango flavored cream. Top of the cake is garnished with the swirls of the vanilla cream and chocolate strands and cherries.